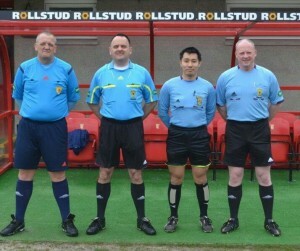 Congratulations to the below officials on the upcoming international fixture. Congratulations to Ka Kuen Mo, Martin Angus, Stephen Clark and Bob Eden who have been appointed as Referee, Assistant Referees and Fourth Official Respectively in the above. The match will be played this Sunday at North Lodge Park, Pitmedden between Lewis United Youth and Banks O’Dee Albion at 2pm.